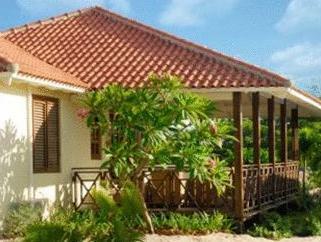 ﻿ Best Price on Blue Bay Golf & Beach Resort in Willemstad + Reviews! The Blue Bay Curacao Golf & Beach Resort is located on what used to be a Plantation which is now a beautiful 18-hole Golf Course and its own private beach. The Resort offers 2 different types of accommodations spread out through the Resort and divided in to 2 sections. Each section has its own fresh water pool area with beach chairs. Even though the different accommodations vary from distance to the beach, style or interior, they all feature fully equipped kitchens,1-3 bedrooms with air-conditioning, a Livingroom, cable TV and a private porch with -beautiful views over the Resort. On Blue Bay Beach, you can find 3 restaurants and a beach bar for your perfect breakfast that delicious bite or a Caribbean cocktail at sunset. The crystal clear water invites you for a swim or offshore dove at our onsite Padi 5 dove school. Front desk and the Golf Pro shop are both located at the newly renovated Plantation House where you can book your tee time, receive your room key, ordering your drink while enjoying a wonderful view. Upon check-in photo identification and credit card is required. All special requests are subject to availability upon check-in. Special requests cannot be guaranteed and may incur additional charges. Please note that front desk is only available from 8:00 to 20:00 daily. Great Place to stay. The diving was exelent and the beach was postcard perfict. The golf looked fun but I didn't play. the only down side was I thought the food was pricy for what you got.